In this use case, let’s assume that you are building an off-the-shelf application that you will sell to clients and you wish for this application to also have a fax capability. However, you would like each of the clients who uses your application to register and manage their own InterFAX account. Your application will need to “know” if the client has registered for InterFAX and refer them to InterFAX to register for the service if they have not done so yet. Once registered, the clients would need to have the option of entering and storing their credentials within the application - the application would also need to “know” that the client is now registered with InterFAX. The client will prepare the document they wish to send as fax - based on your application design, this could be either by choosing an existing document or by creating a new one. The client will submit the fax using a form in your application and your application will then send the document through one of our APIs “Send Fax” methods. Your application will use the credentials provided by the client (this way, the fax will be recorded in this client’s InterFAX account). 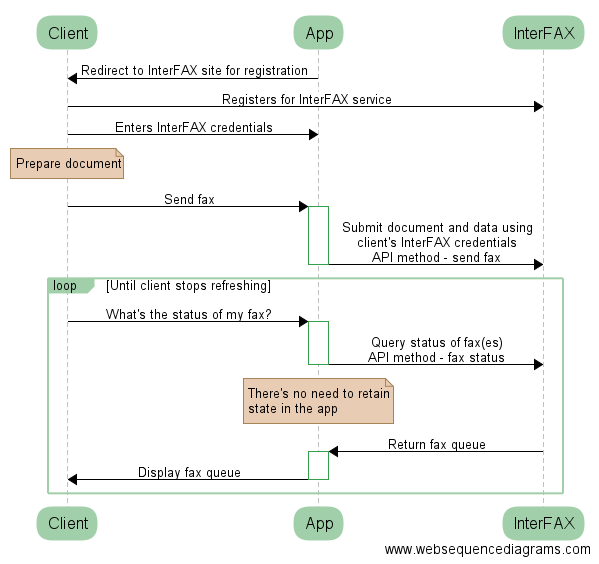 You can then advise the client to check the status of faxes sent based on the tools offered by InterFAX (email feedback or the web portal queue) or your application can retrieve the status of faxes for this client using one of our APIs “Get Status” methods (again, by using the client’s credentials). The client will be billed for his fax usage directly from InterFAX so you will not have to worry about that part.